There are few occasions, excepting a patriotic or religious festival where the Japanese will so unbend himself and forget his “dignity.” At Kyoto, the ancient capital, where I had seen people festive and gay during the day, as they participated in the Great Aoi festival at the Kamo shrine, I observed them in the evening as they witnessed the American thriller, The Hazards of Helen. They made about as much noise at one as at the other, giving outbursts of applause, and even rising to their feet and shouting , just about as much when the hero saved Helen and her baby by venturing to the railroad bridge and jumping into the river with the two in his arms, as the express train whizzed across the screen, as they did when the Suge-kasa and the sacred horses passed through the streets on their stately journey toward the Shinto temple. One was natural, because if there is respect on earth, it is that of the Japanese for the traditions and for the ancient institutions, which the forward march of the empire since 1868 has left remaining. It is not “good form,” not even “proper,” for a Japanese to betray his emotions. At least he must not let them rise to the surface. He may applaud at the theatre, but even while making his very “European” demonstration which is not at all in accordance with ancient custom, as inherited from the Chinese, he must not smile or laugh. The comedian may grimace; gentlemen in the audience are not supposed to do so. The scene may be very thrilling and tense; but Japanese gentlemen should have better control of themselves than to show by ani facial movement that they are moved. But Helen, assuredly very modern, as seen in the motion pictures, caused them to forget some of the things that they had taught by their fathers. They not only betrayed the fact that they got the thrill, but they seemed delighted to do so and seemed to desire to let the hero know that they appreciated what he had done. When “close-up” portraits of the characters were shown, smirking and “looking pleasant,” which is contrary to all the canons of Japanese theatre art, they stood up and waved their hands. When the express train was flashed on the screen, whizzing along at a mile a minute –in a country where trains are likelier to move a mile in ten minutes– they applauded as we in America applaud when a favorite star makes her “big speech” in the third act. 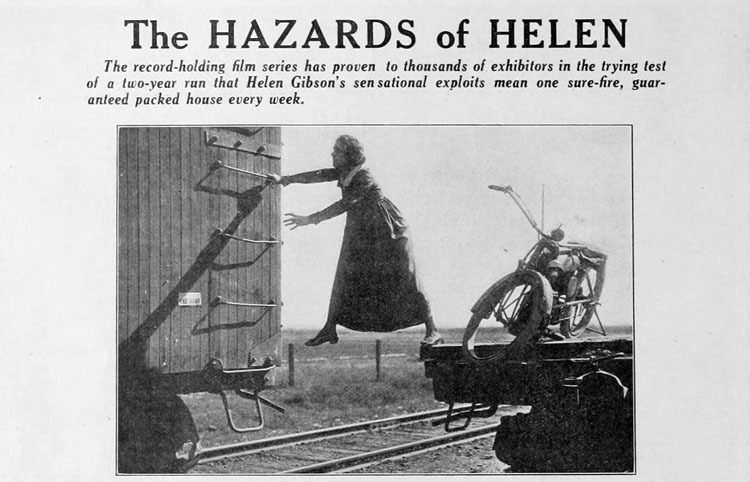 At all Japanese motion picture exhibitions a lecturer stands on the stage and explains the action, even in such yarns of primitive construction as The Hazards of Helen. Oh, he is an eloquent speaker, this “chorus” who explains the play. He weaves much into his “explanation” that is prompted by the picture itself, much that never entered into the mid of the scenario-writer or producer. I was unable to learn the origin of these gentlemen who seem so important to the movie industry in Japan, but they must have had much theatrical experience in their native country. They must have as ready knowledge of all the old plots as the average dramatist in America. Perhaps some of them have acted in Japanese plays, the plots of most of which are the same as the stereotyped plots in American drama. It is the “lecturer” who makes the American movie inteligible to the Oriental audience, at least the Japanese audience, which insists upon knowing something about what is transpiring. The average Chinese audience is not so particular. Chinese actors carry “suggestion” so much further than even the American Mrs. Fiske would attempt to do, their speeches are so absolutely inaudible, on account of the strumming and squawking of the various instruments of the orchestra, that people do not expect to hear too much and have learned to trust to their eyes. Or perhaps they do not care to understand. In the course of a six to ten hour entertainment, which is not an uncommon length of time for a Chinese play to run, they will hear enough to satisfy them and reward them for going to the theatre. It is useless to permit one’s self to become tense and excited about mere play acting. Life itself is much more comic, much more tragic; and they do not become excited about life, seeming to value it very lightly and not worrying about death. Questa voce è stata pubblicata in Cronologia 1916, Film e contrassegnata con Benshi, silent film. Contrassegna il permalink.